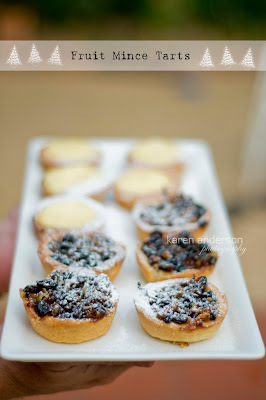 Here is the Fruit Mince Tart/Pies recipe ... Its very easy, even the pastry part, if you really don't think you can do the pastry, Woolworths (and other supermarkets I assume) sell pastry shells that you could use instead. Also another recipe I tried out on unsuspecting guests on Sunday :) .. Baked Orange and Ricotta Tarts. These were just as easy, although there is pastry involved again. And take note of the 2tablespoons of Icing suger in the pastry of the ricotta tarts, not 2 cups like I put in the first time lol ..
1 Preheat oven to 200c. Grease 2 x 12 hole patty tins (muffin tins are a too deep as I found out) To make pastry, sift flour and baking powder into a bowl. Rub in butter using fingertips until the mixture resembles breadcrumbs. Stir in sugar. Add egg yolks and enough lemon juice or iced water to bring the ingredients together to form a dough. 2. Knead dough gently on a lightly floured surface until smooth. Halve dough, wrap in plastic wrap and chill in the fridge for at least 30 minutes. Roll out one of the pastry parcels between two sheets of baking paper until 3-5 mm thick. Using a 6.5cm round cutter, cut out 12 rounds. Place the rounds into the prepared tins. Spoon 2 tsp of fruit mince into each. Reserve scraps for decorating the tops; reknead, wrap and chill until required. Repeat the process with second portion of dough, fillng remaining patty tin. 3. Reroll reserved scraps of pastry and cut into small stars. Top each pie with a star and brush with eggwhite. Bake for 20 minutes until golden. Leave to cool, completely in the pans. Serve warm or at room temperature, dusted with a little icing sugar, if desired. 1. Preheat oven to 200c. Brush 12 hole patty cake tin with melted butter. Process flour and icing sugar in a food processor for 30 seconds. Add butter and process until mixture resembles fine breadcrumbs. Add egg and process until dough comes together. Transfer dough to a lightly floured surface and gently knead. Form dough in to 2cm thick disc; wrap in baking paper and refrigerate for 20 minutes. 2. Roll out dough on a lightly floured surface to 5mm thick and cut out 12 rounds using a round fluted 8 cm biscuit cutter. Line each hole of prepared tin with a round. 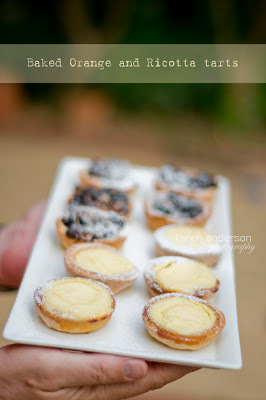 Prick base of each pastry shell with a fork and put tin in freezer for 5 mintues. Form Pastry scraps into a disc and reserve for later use. Put tin in oven and bake for 10 minutes or until light and golden. Stand tin on wire rack to cool. Reduce oven to 180c. 3. To make orange filling, put ricotta and icing sugar in a medium bowl, add egg, orange rind, essence and flour and whisk to combine. Spoon ricotta mixture into each cooled pastry shell. 4. Roll out reserved pastry until 5mm thick. Cut pastry into 5mm wide strips. Cut strips long enough to reach from one side of tarts to the other. Top each tart with 2 pastry strips, to form a cross. Brush pastry with extra egg. Bake for 15-20 minutes or until ricoota mixture is form and crosses are golden. Trasfer to a wire rack to cool. When cold, dust with icing sugar and serve.